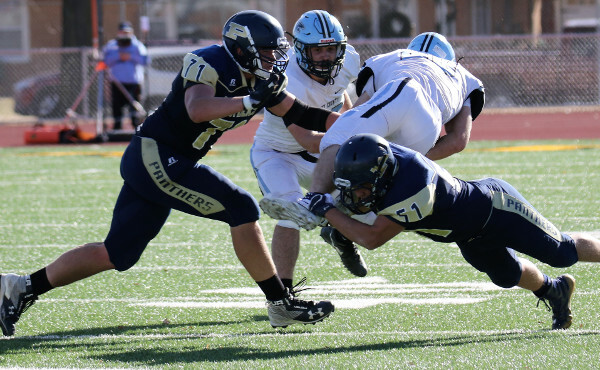 SALINA — A prediction of a tough defensive battle held true in the 2A State Championship game at Salina District Stadium Saturday afternoon, as the heavily favored Phillipsburg Panthers topped the Riley County Falcons, 27-0. As expected in a defensive showdown, it came down to turnovers, as the Panthers forced five turnovers and their defense hung tough to force two more turnovers on downs. The Falcons, who finished the season 10-3, were held to 150 yards for the game, and the Panthers, who finished undefeated at 13-0, only managed 262 yards. The surprise from Phillipsburg was their passing game. The Panthers, who came in averaging almost 300 yards per game (3,548 yards and 51 touchdowns in 12 games) struggled to get their running game going. But senior quarterback Trey Sides was able to catch the Riley County secondary off guard and connect on a few big passes, to get on the scoreboard early. Sides finished with 150 yards passing and two touchdowns on a 10-for-day. “We got behind them a couple of times,” Covington said. Sides wasn’t just dominant on offense though, as his interception of opposing quarterback Garrett Harmison at the 7:50 mark of the first quarter, set the Panthers up at the Falcon 27. Three plays later, the older Sides connected with his younger brother Ty, a sophomore, for a 24-yard touchdown pass and a 7-0 lead. It went back to a defensive showdown after the Panthers scored, as neither team did anything for the next 7 possessions, 4 by the Falcons and 3 by the Panthers. But despite burying the Panthers at their own 19 to start their next drive, Phillipsburg put together a 7-play, 81-yard drive, once again including two big passing plays – as the Sides brothers connected for 32 yards to the Falcon 26 to keep the drive alive, and then Sides found senior Nathan Moon in the end zone 2 plays later for a 14-0 lead. The Falcons looked to get back in the game at the start of the second half, as they quickly drove to the Phillipsburg 9. But then the drive stalled, as the Panther defense stepped up again, hitting the Falcons for losses on consecutive plays, then knocking away a potential TD pass on 4th-and-14 to keep the score 14-0. Eleven plays later, the Panthers stalled at the Falcon 28, but senior kicker Jonathan Hunnacutt drilled a 45-yard field goal to extend the lead to 17-0. Hunnacutt’s kick was a huge part of the second half (he later added a 41-yarder), as the 45-yarder gave the Panthers a three-possession lead. “I’d rather get it in the end zone, but if I have to kick a field goal, I’ll go out there and do it,” Hunnacutt said. But Hunnacutt was also quick to give credit to his offensive line. Hunnacutt played a little defense himself though, making two tackles on kickoff returns that could have resulted in Falcon touchdowns. The Panthers added another late score, a 3-yard scamper from Tanner Ragsdale with 5:43 left in the fourth quarter, for the final margin of 27-0. The Panthers’ senior class finished their careers with a 49-4 record and two state championships. But while the Falcons came up short of a state title, head coach Steve Wagner was not disappointed. Their two previous losses to Silver Lake and Southeast-Saline were both avenged in the playoffs, and his Falcons hung tough in the school’s first trip to the title game since 1993. “You can lose on the scoreboard and you can lose other ways,” he said. “Our guys lost on the scoreboard today, but we played them hard to the end and gave them all they got. RUSHING —RC: Waggoner 11-58, Harmison 5-(-27), Kulp 4-4, Allen 3-34, Barnes 2-27. Ph: N.Moon 12-37, Ragsdale 12-36, Gross 11-43, Tr.Sides 4-7, Team 4-(-12), Ty.Sides 1-1. PASSING —RC: Harmison 9-26-3-54. Ph: Tr.Sides 10-15-0-150. RECEIVING —RC: Claar 5-28, Kulp 3-26, Allen 1-0. Ph: Ty.Sides 6-103, N.Moon 2-35, Sisson 1-12, Miller 1-0.